Not so long ago, right? Well we had some difficulties finding good internet in Bolivia. As always you will be overloaded with text and, mainly, pictures! Given our experience in Bolivia, we feel that a small intro is due. In all honesty, Bolivia has never been high on our travel list, partially as we know almost anything about it, partially due to the things we heared the week before entering the place. When approaching Cusco, relatively nearby the boarder with Bolivia, we started to inform ourselves about the place. It turned out that most travellers we met came from there and they were not very enthusiastic. To summarise the points, Bolivia would not be an easy country to travel through, as they would be slightly inhospitable towards tourists, sometimes unwilling to sell fuel to foreigners and if they do so at triple prices (according to the law). In addition, the locals - always referred to as indigenous - would be uninterested to socialise. As always, everyone needs to have their personal travel experience and we experienced that all of this was wrong, wrong and wrong. Yeah sure, Bolivia is a though country to travel: It is rough, roads are bad or sometimes unexisting, and basic facilities are not always easy to find. But, we truly want to advise everybody feeling like an adventurous trip, to book a plain ticket to Bolivia together with a 4x4 and visit it! We have only had pleasant experiences here and we have truly only met wonderful people! On top, it is pretty cheap here! So we started our Bolivia experience, on Mireia's Birthday, on the other side where we left Peru, at lake Titicaca, trading in the rather unpleasant village of Puno for the more tourist oriented village of Copacabana. This turned out to be an excellent place to relax a bit, to enjoy the beautiful sunset and to visit another lake Titicaca island, la isla del sol - the sun island, as the Incas believed the sun was born here. Indeed, the sun shines strong here, being at a lake and at altitude. The island is perfect for short hikes and provides excellent views of the lake itself. We visited it together with Cedric and Virginie (French Swiss), who we had met previously in Cusco and with who we would visit some places in Bolivia, and with another Cedric and Alicia, who we met on the island itself. After having our batteries charged and our car scratched - please don't ask, but it was our own mistake and nothing serious - we and the French/Swiss let our car be baptised at the Copacabana church. It turned out that we had more troubles after this has happened, so not sure if they had used the right holy water for our cars. After being blessed, we oriented ourselves to the largest city of Bolivia, La Paz. Here we stayed at a campsite, we heard only good things about it, together with a lot of travellers (Our opinion: We cannot recommend the place: the parking was tiny, and it was completely overpriced as none of the promised 'goodies' were included or functioning). The city of La Paz is interesting as we perceived it as a pleasant place to be and a good place to visit, although the reality is that there is absolutely nothing, really nothing, to visit, only markets and artisans shops. From La Paz we and the French/Swiss go our own way, to see each other again in Uyuni to visit the saltflats together. We go a bit north to do the legendary 'Death Road', a road previously identified as the most dangerous road in the world due to a combination of narrow roads, land slides, huge drops and a lot of traffic - in the past. This has all changed in the last years with the construction of a brand new highway and the death road is now a tourist attraction ridden by many bikes a day and some vehicles. The 70 km long road is indeed pretty narrow at some places, but this is really only at 2 to 3 places, but for the rest it is very similar to many of the roads we had driven so far, still it makes sense to drive it once we are here! At the end of the road we find ourselves in Yoloas where we visit a animal rescue centre and see some monkeys and birds. We head back direction La Paz to sleep on the highest point of the new highway, at 4.700 meters. We arrive here - we passed here earlier - to find everything covered in snow! Our next stop would be the Sajama National Park, nearby the Chilean boarder. The park itself had some nice spots and was situated in an amazing setting of dessert like terrains surrounded by glaciered mountains. The night was an absolute preparation for our Uyuni nights - which is known to be cold, up to -20 degrees at night is very common. After a difficult wake up we prepare to go into the direction of Uyuni. Now at this stage we have informed you that the roads are not always excellent in Bolivia, but this is not the only thing which is bad. The other things, related to them, are the maps if it is digital of paper maps or very inaccurate and hopelessly incomplete. This we would find out in the next days heading to Uyuni via the ' adventurous way' straight from Sajama. Some of the roads would turn to be on our opensource digital map, many others were not. Some of the village could be found on our paper map, many others would not be marked. So leaving Sajama we were ready for adventure, and we would get it all that day. After 30 km we pass a road which had a lake with flamingos a km from it. Keen to see them from more nearby (Mireia's desires always come true), we leave the road and drive towards the lake, with the camera in hand. When being really close, we go slow and let the car drive stationairy in first gear, taking pictures at the same time. Before we realise it Alex says to Mireia: We are in big trouble. We stand a km away from ' the main road' which maybe sees one car a day, stuck with the car in a mad until the differential, with the leafsprings being even lower than the diff. Outside it is sunny, but we are high, and there is a wind which approaches 100 km per hour. Let the fun begin! Survival instinct took over and during 3 hours we digged, searched for rocks, high-jacked the car and everything what we thought we could do to get out of there. Our first two attempts to drive out were unsuccessful and put spirits down. The third one was successful, with the help of the stones Mireia brought from far, as around us there was nothing but mod, brought us back to the road. VanBaelenGuillot team did it! At nightfall, our adventurous spirits were tested again when a sand storm started slowly. At this stage we found ourselves next to the Coipasa saltflat, just nort of the Uyuni saltflat. Suddenly, the road stops and there are no more tracks to follow. So we search during half an hour for any sign following individual tracks, none of which bringing us towards the main road. Finally, we luckily find it and can proceed our trip and find a place to sleep. By now this storm has taken a enormous strength, seriously pushing the car left and right and completely taking over the view. We could see nothing, but really nothing for moments. So we stood still on the road, waiting for the wind to go down for a minute so we could proceed towards the next village and hide behind a building from the wind. The next day we arrive in Uyuni in the afternoon, ready to meet Cedric and Virginie again so we can visit the Salar together and to have a well deserved beer after the previous stress. It appears that Uyuni is without electricity, no fresh beer, limited food, no internet to check where our friends are and hundreds off cars at the only working gas station of the village which had generator which could power one pump - there were people waiting for fuel half a day. We didn't find our friends, so we decided to go to the salar on our own. However, on our way there we meet them. When we want to explain our story...surprise! they went via the same road and...they also got stock the day before us, in a river! We stay one more night in Uyuni and we prepare to go to the salar, we buy food and lots of fuel as the locals do when they go on the gringo tour. We have no idea how many km we'll be driving so we fill up and take 100 liters of diesel with us in bidons. So anyhow, we head to the Salar de Uyuni, approximately 12.000 square kilometres big. It is an amazing place, where you have nothing around you and the views are endless and the horizons are only filled with some small mountain peaks. In the middle we sleep at the Isla Incahuasi, an atol filled with giant cactus up to ten meters high! From the Salar we follow the Gringo trail, going south to the Laguna Colorada, a big lake coloured red due to some algue activity, and many other mountain lakes. All this via amazing roads or simply without roads, through desserts as you feel. When being here we understood why they choose for this area as the alternative for Dakar! These days we really put the car to work and there was no sign of hesitation at any moment - and the advantage of having a diesel is that it consumes so much less than a gas 4x4 in those situations - we only used 20 litres of our 100 litres back up. On top, we had many freezing cold nights, where the water pipes were frozen on the inside, but we are very happy that the fuel pipes have never frozen at night. There we meet again with French-Swiss, which we left behind while going to Laguna Colorada, we also meet them an Argentinian couple which we met in the Salar. Completing the loop and being back in the city of Uyuni, we head direction the capital of Bolivia, Sucre together with the French-Swiss. It is funny to have this as the capital, because it is really a small village compared to La Paz although very beautiful! We are a bit in a hurry at this stage as we have football tickets waiting for us and we need to be in Rio the 22nd of June. We therefor say goodbye to Virginie and Cedric and head direction Santa Cruz, the second largest city of Bolivia. We go there following the Che Guevarra trail, passing by la Higuera, were El Commandante was murdered by CIA trained Bolivian troops. The route brings as at beautiful villages with a Mediterranean feel to it. In Santa Cruz we stay a few days, as we had some rust issues we preferred to have resolved here. A fist large hole could be found on either side of the car body from where water could enter and this is not something you want to have when crossing rivers. Three days after having left it at a Toyota garage (where at first they said No, as it was a foreign car) we pick up the car, happy with the result and the price! We were now ready to go towards the Brazilian boarder. We decided to go for the less popular boarder at San Matias as it would bring us passed some Jesuit churches which turned out to be nice to see and it would bring us right at our first stop in Brazil, the Pantanal. The Pantanal is an area the size of France, located in Bolivia, Paraguay and Brazil and had the highest concentration of Animals of the American continent. To get here we have a two day 500 km long dirt road bringing us though the Bolivian part of the Pantanal at the end. Luckily we are at the very end of the rain season and the road was in a relatively dry condition and finding itself in different conditions ranging from pretty okay to pretty crap. At the end we find the village of San Matias and the paved road is waiting for us in Brazil. 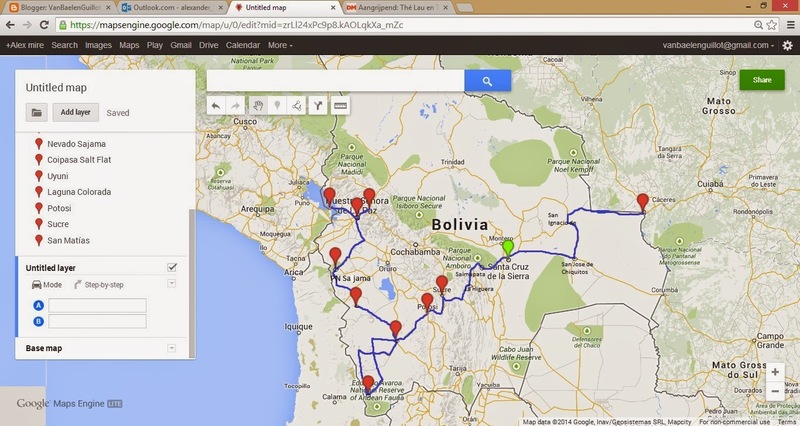 Here ends our adventure in Bolivia, which has been pretty impressive to us. The country and its people have treated us very well and we have had no issues at all - even if we got many preparing tips before entering. The only exception might be the process to by fuel, as locals pay 3,8 bolivianos per liter and foreigners pay 9,2 - in theory. In reality we have almost never paid this full price as we always negotiated a better price or we filled the car with bidons. All in all, great country to visit!!! Preparing the car for the benediction at the Copacabana church - let's see if it brings luck! La Paz style; One shop sells stuff, every shop in the street will sell exactly the same. Shopping made easy! Attack of the bulls! Get out of here! Wildcamping with fire, it gets mega cold, can it get better? Passing flamingo, without getting stuck this time! It is chilly up here!! Can you see the Dakar in your mind? What a story. But everything seems to be OK. The pictures are so beautifull. And about the blessings: your Belgian foorball T-shirt was succesfull as Belgium-Algeria ended 2-1! Spectacular!!!!! Mucha suerte!!! Petons als dos mire!!! Miss you! !